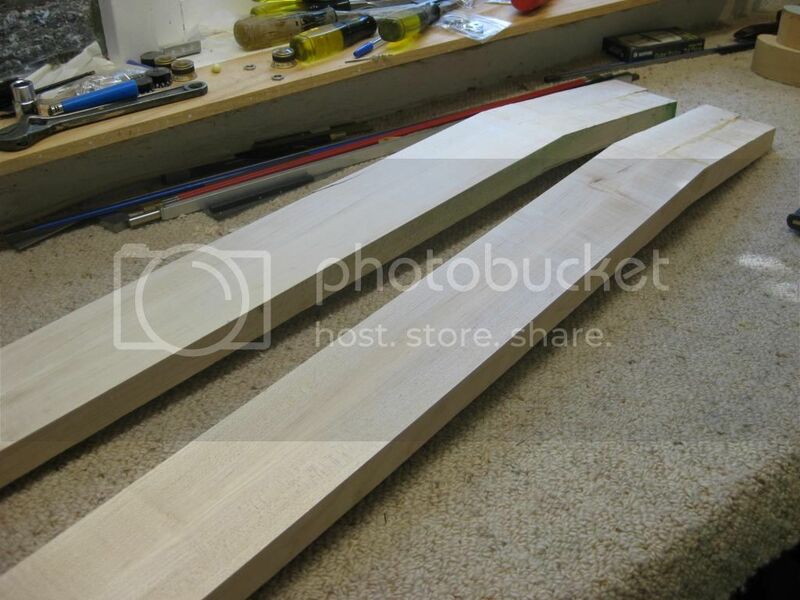 I've set myself to create a new series of basses starting with some double cut and some neck-through models. All of these designs have their origins in Peter Lamburd's 6 string blue bass (hence the PLB model designation). 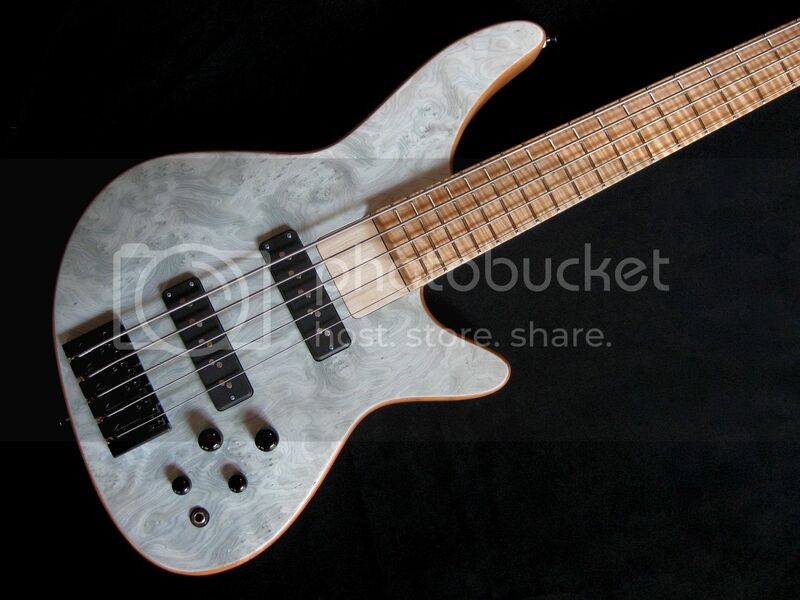 The body size has been narrowed down for these 5 string versions, and an upper horn has been added. The lower cut-away/horn is retained from the original design. 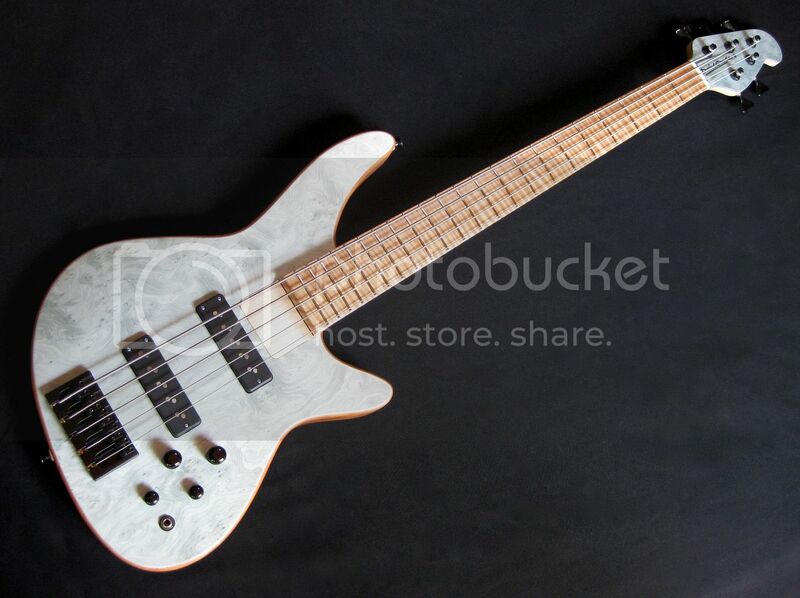 This model is a slightly smaller version to its Alder twin. 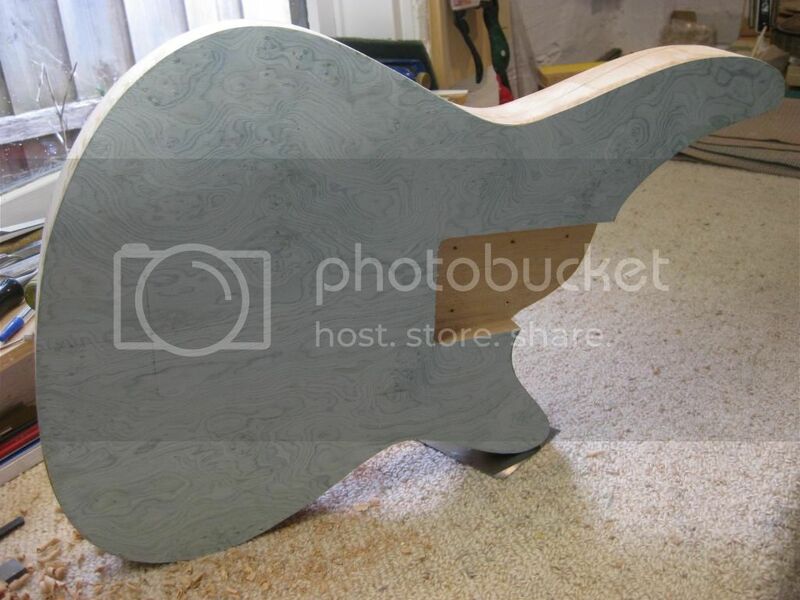 This time with Mahogany as the body wood and some wild blue veneer on its face. 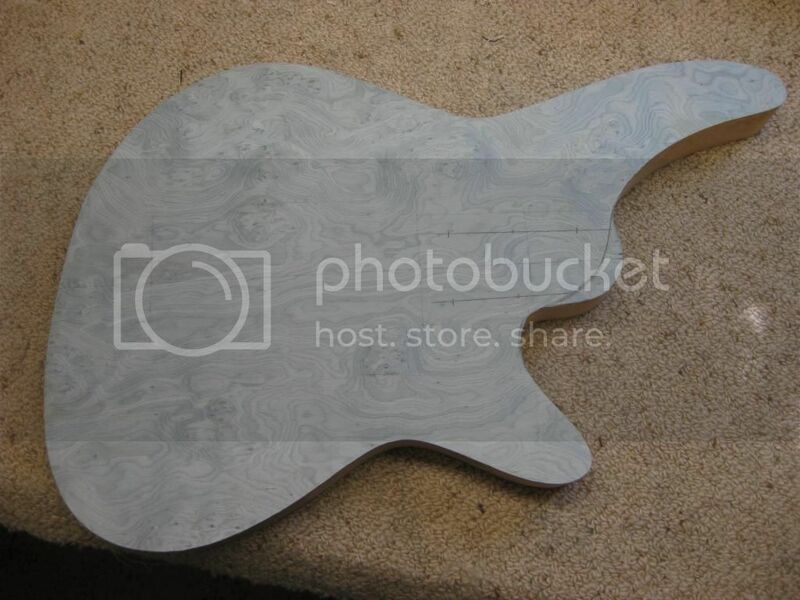 The construction of this bass will also be bolt on (5 bolt). 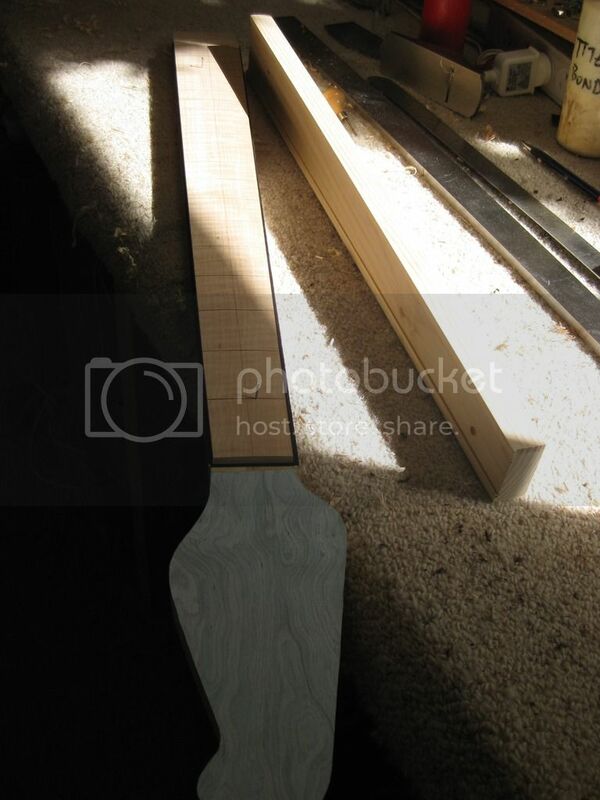 The neck will also be quarter sawn maple with a rosewood fretboard, dual action truss rod with graphite rods. 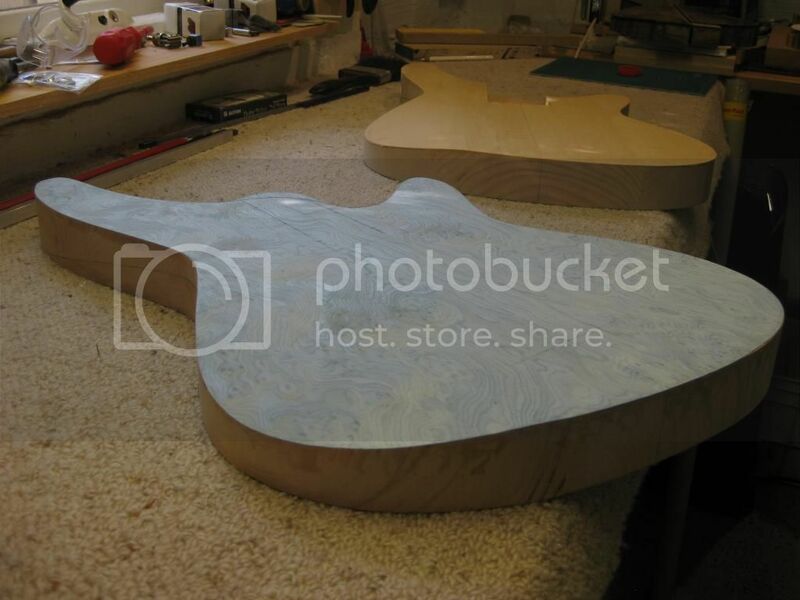 It's scale length will be 35" and have small frets as per its twin. I haven't locked in the type of pickups that I'll use yet (so many great options now. We really are spoiled for choice!) The bridge will most likely be Hipshot type A. Last edited by David Searle Guitars on 14 Dec 2015, 10:41, edited 1 time in total. Marking out the neck pocket. 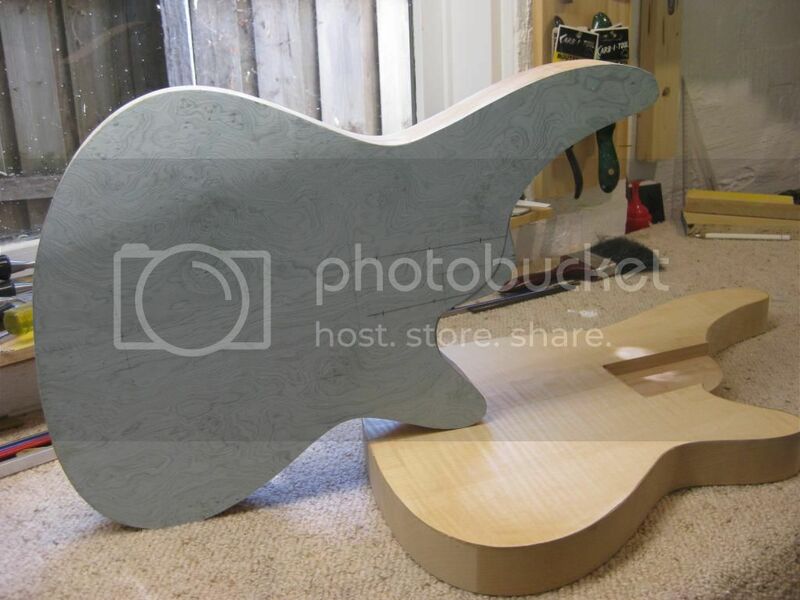 Two piece quarter sawn maple. Awaiting there next machining. I like to rest them for a while to allow for possible movement after the first lot of machining and gluing. The neck pocket machined in. A little hard to see, but with this shot I've captured the neck with its matching veneer on its headstock and its highly figured maple fretboard. 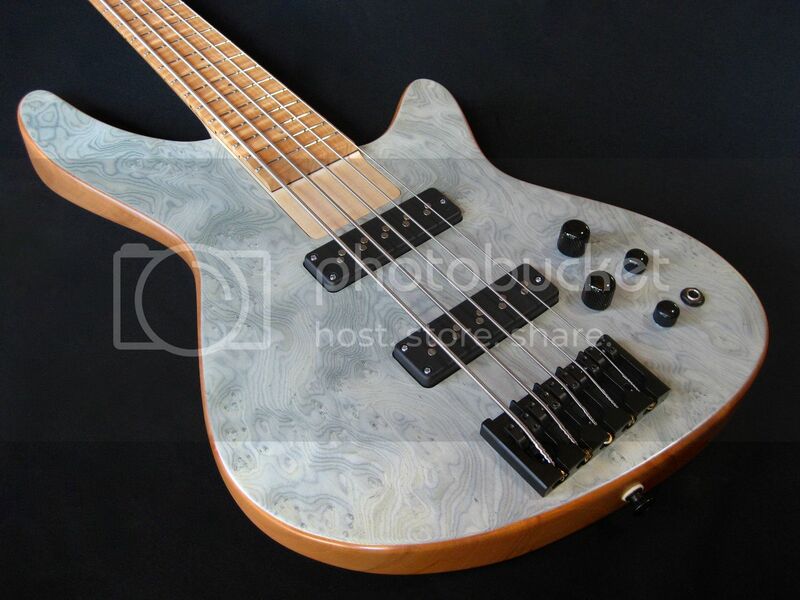 I've just recently finished this 5 string bass and would like to share some shots and specs. Body: Mahogany with a man made dyed veneer overlay. 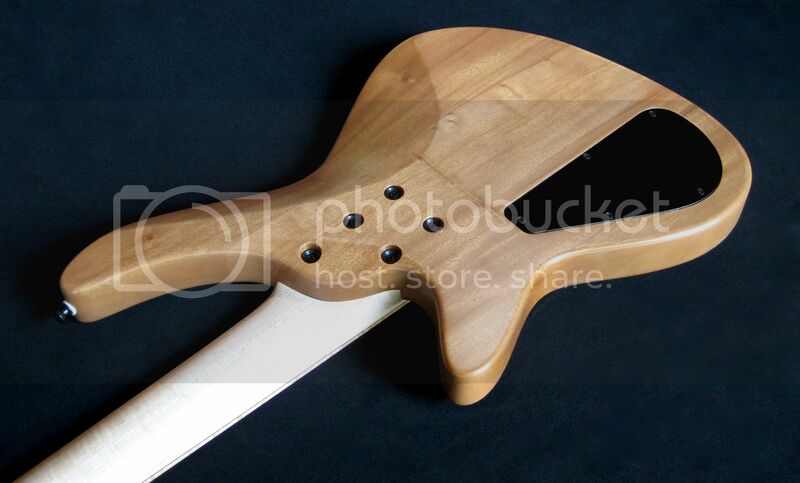 Neck: 2 piece quartersawn (lightly figure) maple with a black veneer. 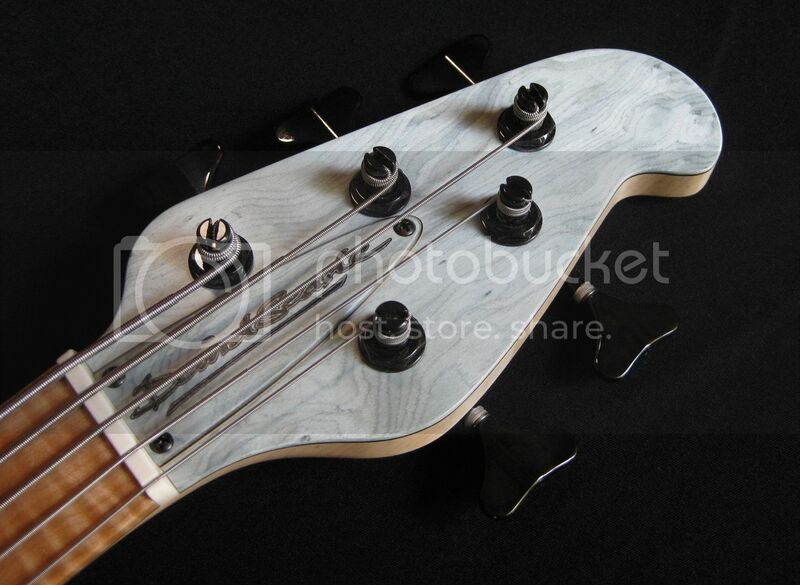 The fretboard is highly flamed maple with Paua shell dot position markers. 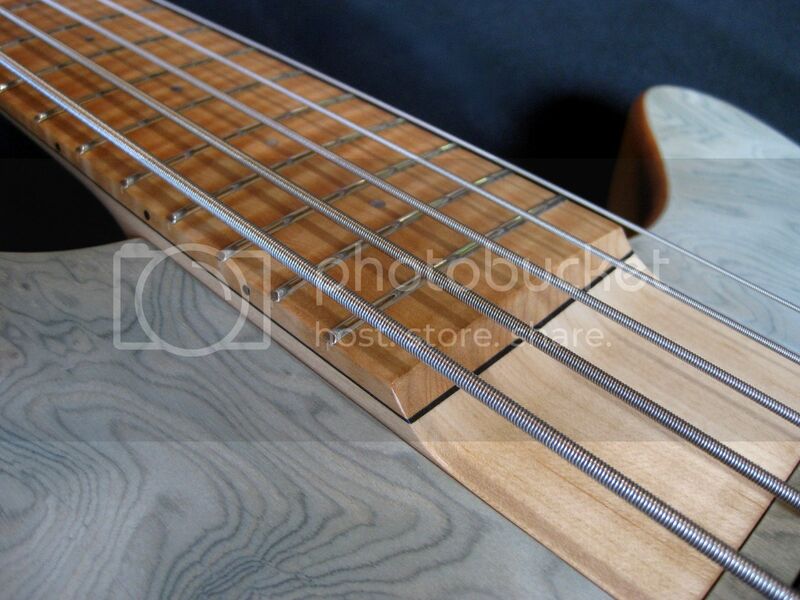 Double action truss rod with graphite rods. Note: This body style is slightly smaller that my current crop and will become my standard body size for bolt on 4's and 5's in the future! It's super comfortably! Last edited by David Searle Guitars on 14 Dec 2015, 10:42, edited 1 time in total. Some nice detail shots to finish with. 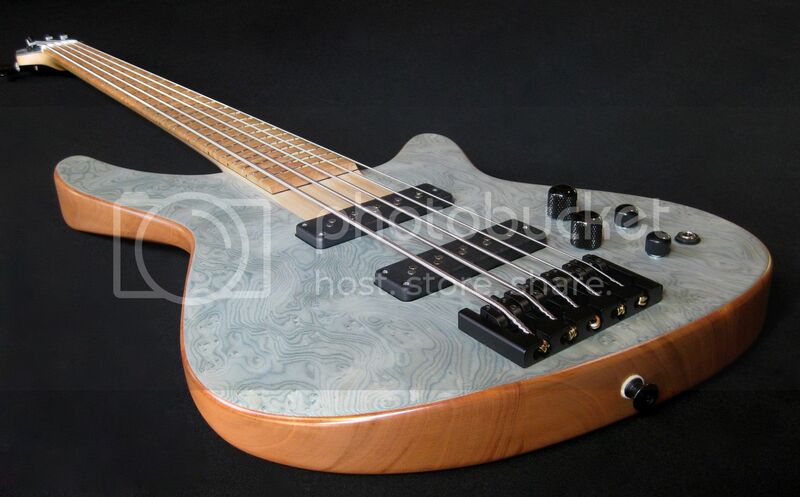 Interestingly this bass out of my current production run is the nicest one to play regarding comfort and fit to the body. The veneer has an amazing visual impact that reminds me of paisley and I love the colour combination with the blond neck and fretboard! May I ask a slightly 'out there' question? I'm looking at the reverse side. Is that a natural colour for mahogany? So if I 'rehabilitated' an Epi EB0 or EB3 by rubbing it back or otherwise stripping the Cherry colour, would I get to that colour wood? Purely theoretical question for now btw. RedVee wrote: That does look pretty good. Well you'd have to get right under whatever the maker has put on there. With modern finishes that's not always as easy as it once was! Also mahogany can vary in its colour intensity. Some of it is a light tan/orange, some of it is more orange/brown. All of it will oxidize to a deep brown if exposed to sunlight and oxygen for long enough! Thanks David, yeah I thought it had a reddish hue. So it sounds like a gamble then, maybe I'll give it a go 'sometime' if all the stars align. Can always apply a finish again if it comes out crook. 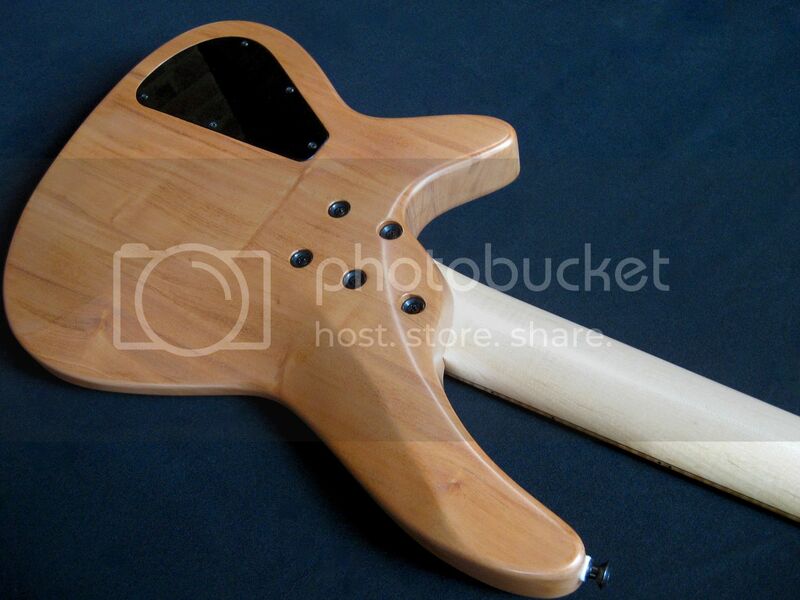 I was thinking a light (almost pine furniture) coloured EB3 to Ripper shape could look ok.
That looks incredible... Unique and classy. Hi David, would you be able to say what the weight is for this bass?